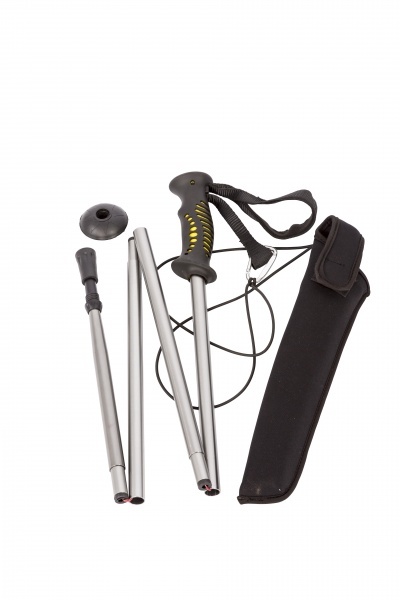 A new lightweight, slim profile aluminium wading staff, for reduced water resistance. The 4 section design, locks firmly in place & tensions with a sliding collar, so the staff cannot collapse, even if you catch the rubber cap between rocks. Remove the “silent wading” rubber cap & you have a hardened steel tip for extra grip & it comes with an optional screw on ‘tip-cup’ to spread the load in soft sand, mud or snow. Ergonomic rubber handle grip, with adjustable wrist strap & detachable, elasticated lanyard.